This weekend was the London Coffee Festival. It is clear that coffee is a big deal. It has been a big deal for some time now. And anyone attending the festival this weekend will be as surprised as me to see just how big that deal is. Based in The Old Truman Brewery on Brick Lane, there was room after room of bearded coffee geek. Beards are big in the coffee world too. As are Antipodeans. Why is it that the best coffee makers are from Aussie or Kiwi descent? They have a knack of drawing out the smoothest deepest flavour that make the most of the roasted bean and the creamiest tones in the milk. It all starts with the bean and these days we celebrate the speciality coffee movement known as third wave coffee. Whilst the history of roasted coffee goes all the way back to 1000AD, wave one was officially registered when coffee plants reached the new world in the early 18th century and became a worldwide commodity by the late 1800’s. Speciality coffee evolved in the 1960’s with Espresso bars like Peet’s in the USA and was the platform from which Starbucks launched in Seattle in 1971 – generally acknowledged as the face of wave two. For decades it was de rigueur to know your tall from your short, your latte from your flat white and your wet from your dry. But as with all worldwide mass brands that invade the culture, there is a kick back against it. The third wave movement was that responder, celebrating the nuances of roasting coffee, in the same way that winemakers make wine. The beans are sourced not only from specific countries, but directly from farms and at times even from limited trees within that farm. The flavours are cultivated with careful, skilled, fresh roasting that draws out the unique characteristics of each bean as appropriate in each farming season. It has bred a world of micro roasters who are getting incredible flavour and specialising in the art of roasting. The art of coffee also lies in the brewing method which has created an industry of coffee paraphernalia… and the milk. A few years ago I went to LAMill Coffee in LA which had a huge menu of something like 20 coffees and every which way to brew it. You had to choose your bean and then your chosen method of preparation. Then the experts would prepare your chosen beverage. The only issue is that my knowledge was not there, so I really didn’t appreciate which bean or which method. I just wanted a nice cup of coffee and even after a 12 minute wait, I have to admit it was one of the poorest coffees I had during that trip. Sometimes I feel that the madness becomes so insular that it forgets to bring the punter on board as well. So best to leave it to the experts and take their recommendations instead. I had a good chat with Climpson & Sons at the festival. They are the roasters we use at work and are based in Broadway Market, making really fab beans. They even treated me to what they said was the world’s best coffee… the Colombian Las Margaritas. I did enjoy it but honestly am not sure my expertise really appreciated just how special (or expensive) it was. Also at the show was a coffee/food as well as a coffee/wine pairing area; roasting workshops; a barista championship; latte art masterclasses and much more. For those in the know it was a great way to celebrate this ever growing industry and to share coffee stories with like minded enthusiasts. For others, just a chance to compare beards and play trendy games. But whatever your take from it, the celebration of all things coffee will continue for a long time to come and so for any discerning food business, you have to know to get on board and smell the coffee…just make sure it is a well roasted, perfectly crafted one! In the past few weeks I have been finishing the Christmas buying for our shops and invariably the December purchases revolve around alcohol as much as anything else. 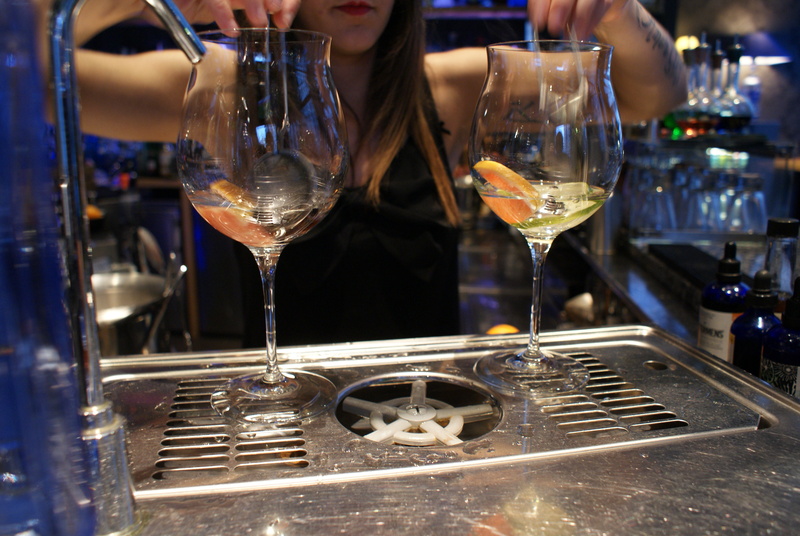 I was pointed towards Termini Negroni – a bottle that the guys had been served at a party. It was made by cocktail guru Tony Conigliaro and looks super lovely as well as apparently tasting pretty good too. In his blog (where I sourced the pic), Mr Conigliaro talks about the fact that they combine the ingredients and then cook them sous vide to really fuse all the flavours and ensure consistency. This is apparently called flash fusing – read more here. I then looked up the recipe for a classic negroni which is one part each of gin, vermouth rosso and campari garnished with orange peel and served over ice. It is a little too full on for me, but it got me thinking about sofagirl from Campari and Sofa and I was just going to e mail her when another bottle came to light. This time, it was a bottle of Vermouth from the clever team at The Ethicurean. I only recently discovered this team of food and drink enthusiasts who seem to be doing lovely things with food from the Barley Wood walled garden down near Bristol as well as supporting smaller artistic projects so they are most certainly on my list to visit right now. But in the meantime, I was able to meet a couple of them the other weekend when I popped along to the Do Market to meet the team behind The Do Book Co. The market was a combination of the fashionable Shoreditch set so a bit young and hip for me but all that changed when I discovered the Vermouth stand and I was hooked. The Collector Vermouth is made from 20 botanicals picked at the Ethicurean’s walled garden and the surrounding Mendip Hill. It has taken three years of experimenting with herbal combinations and alcoholic processes to perfect their drink but they certainly have it right now. It has a purity of flavour that really does capture the essence of the herbs and is so wonderfully packaged and branded that I just had to get a bottle. We tried it in the office as soon as I got back to work and everyone loved it. The recommendation is to simply have it over ice with a bay leaf in it but I was convinced that there was something between the pure Vermouth and the Negroni inspiration so made a mix of my own. I knew that there needed to be a nod to the orange/citrus flavour, so simply mixed it with freshly squeezed clementine juice which is seasonally available from Pret these days and hey presto…a simple yet very effective cocktail to be proud of. Now all I need is the expertise of Sofagirl, who is the best person I know to experiment with cocktails so when are you coming over to try some? 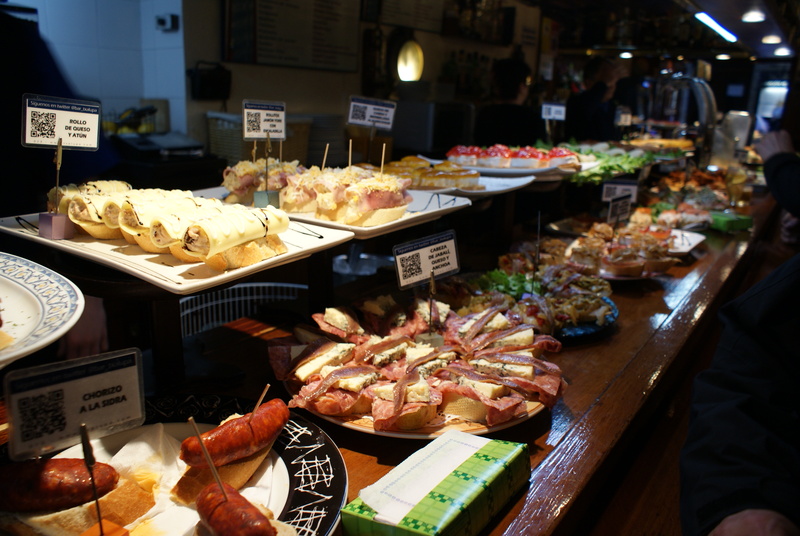 San Sebastian has been on my list of food places to visit for some time. 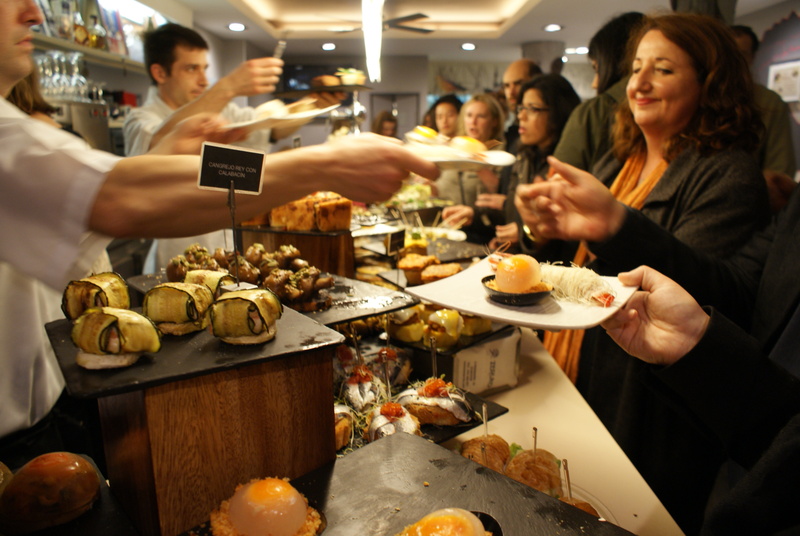 I wanted to go with a few of us so that we could really do justice to the pintxos and last week that came to fruition. The first thing that struck me was just how beautiful the city is, with impressive architecture, a river running through it and two magnificent beaches embracing the northern parts of the city. There is a vibrant energy and happiness about the place which I put down to the great food, drink and lifestyle. People openly embrace, hold hands when walking together and at times burst into spontaneous song. It is easy to get swept up in the optimism and enjoyment of life here. 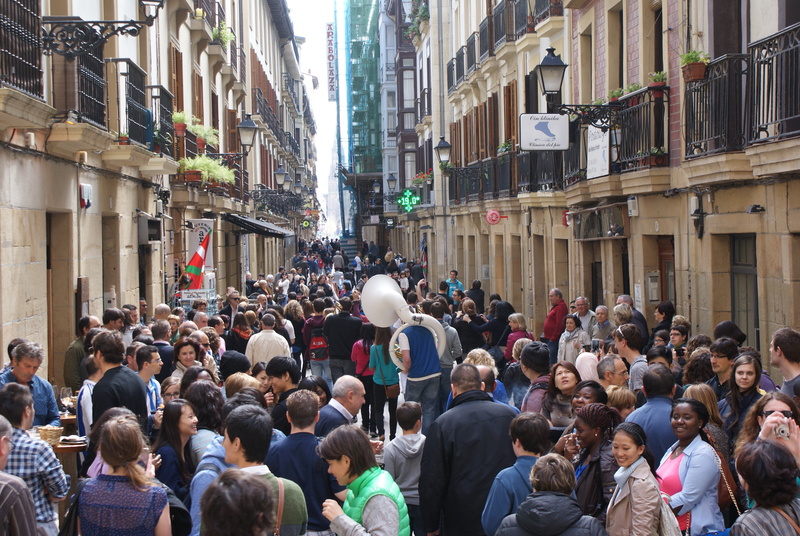 Saturday lunchtime in the old town – spot the youth orchestra singing and dancing in the street! I am told that the Basque people are an honest straight forward food loving lot and I guess that’s why I feel at home almost immediately. 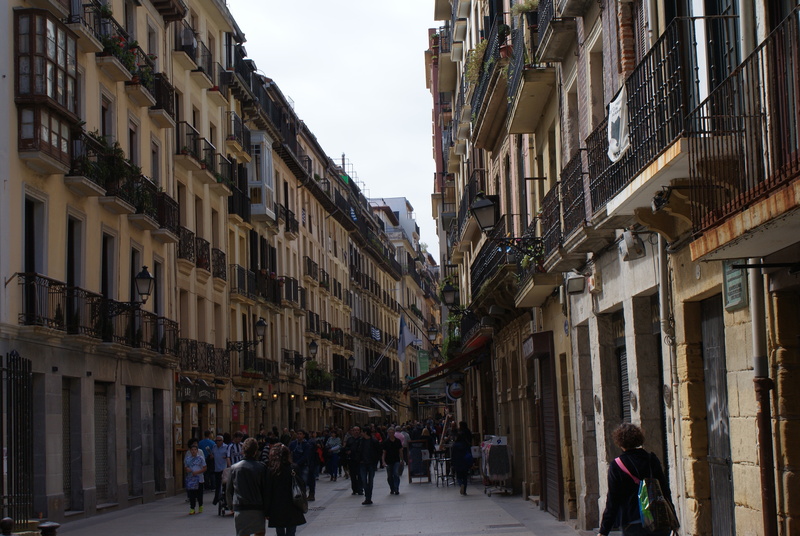 Don’t get me wrong, it is rowdy and rambunctious at times and there is the Mediterranean spirit flowing through that can intimidate a reserved Brit like me, but there is a central heart of happiness here that I love. 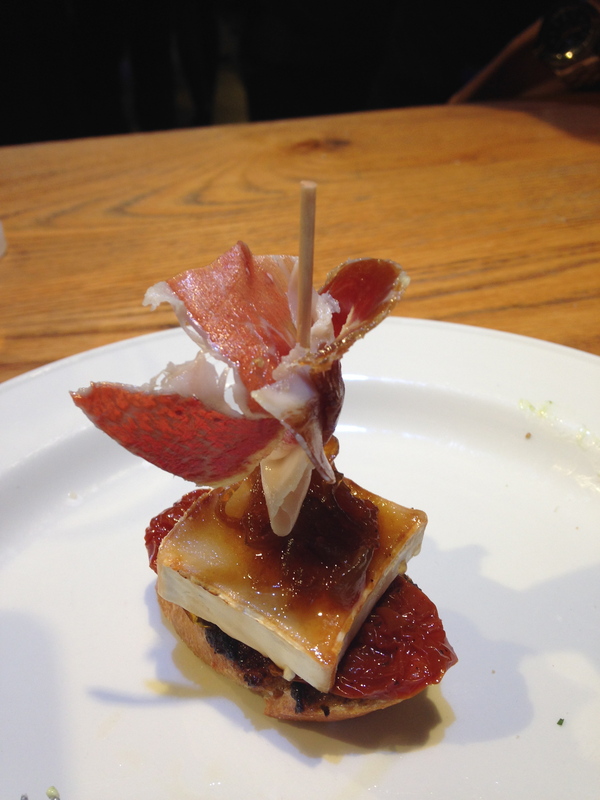 The pintxos experience is one that everyone must try and at first it is a little strange. You go into a bar that is resplendent with plates of food. There are no health and safety legalities here – everything is out there for as long as it is out there, uncovered and ready to be eaten. You ask for a plate, take what you want and there you have it. When it needs heating up it will be taken from you and returned microwaved and ready. When you order specials from the menu they are speedily returned from what seems to be the teeniest of kitchens piping hot and glistening. Everything has to be washed down with a drink. 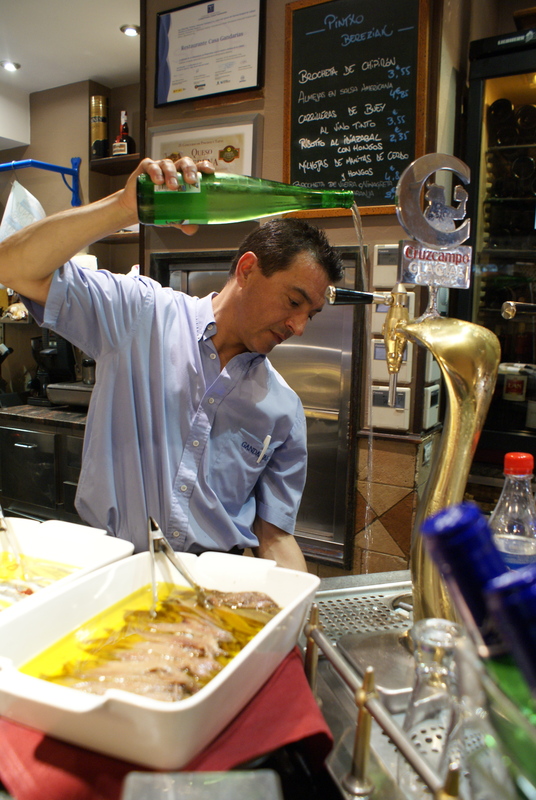 The local speciality is txakoli which is a very young white wine, poured from a heady height to encourage the sparkling character to fizz in the glass. What amazes us is just how adept the bar staff are of keeping track of what you order. There is no need to pay at the time. You just add on more and more things and somehow they know what your bill is at the end. There is an air of trust because the Basque people would not dream of taking advantage or lying about what they owe. They are such straight up people. So it leaves you feeling free and trusted to embrace the food & drink and just take in the experience. It is loud, it is bustling and it is most definitely infectious. Knowing which bars to go to is an art in itself. 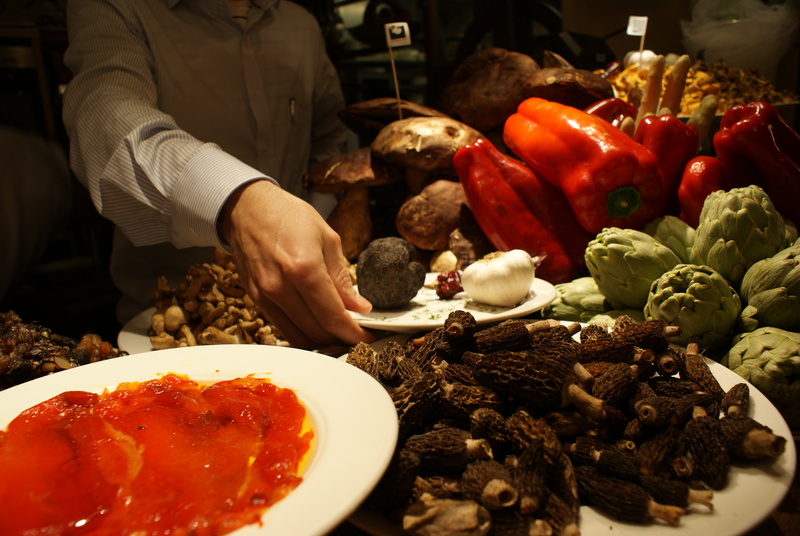 Some places specialise in mushrooms (Ganbara) and others in steak (Gandarias) and of course prawns or gambas are widely featured whilst the modern molecular gastronomy is showcased at its best in Bar Zeruko. Then again the very traditional dishes served only to order from a blackboard at Bar Borda Berri were some of the best we had. 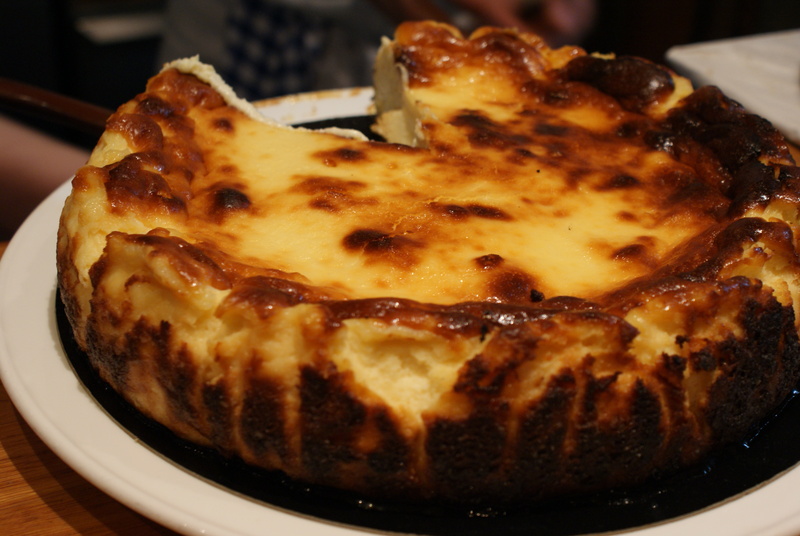 And you really do have to try the cheesecake at La Vina. I don’t think it is as delicious as my Mum’s but that’s not the point. They are generous in their portion, so sharing is most definitely recommended and that caramelised crust is yum. If in doubt, the guys at San Sebastian Food in the impressive Hotel Maria Cristina are well versed in the right place for the right thing and their interest and passion shows through as they genuinely want you to enjoy their city and the food as much as they do. There is also an impressive shop full of locally sourced treats to take home. A little off the beaten track over in the Gros area is Bergara which is not particularly well publicised in any of the articles that you see but is most definitely a choice for the locals (maybe they want it as their secret). 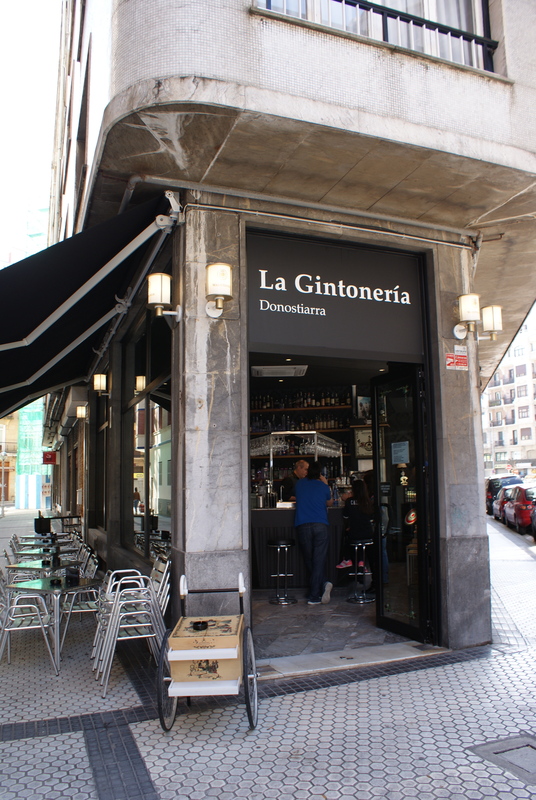 This side is less well explored but everywhere we tried we enjoyed and this is where the Gintoneria lives, so what’s not to like? You most definitely won’t starve in this city and I will forever marvel at the fact that food which stands on a bar and is then microwaved for your delectation can be such a fabulous food experience. But it just goes to show that simplicity and atmosphere can account for so much when you are enjoying a meal out. Get on a plane and fly here for a long weekend. It is so ideal and I will most definitely be coming back. 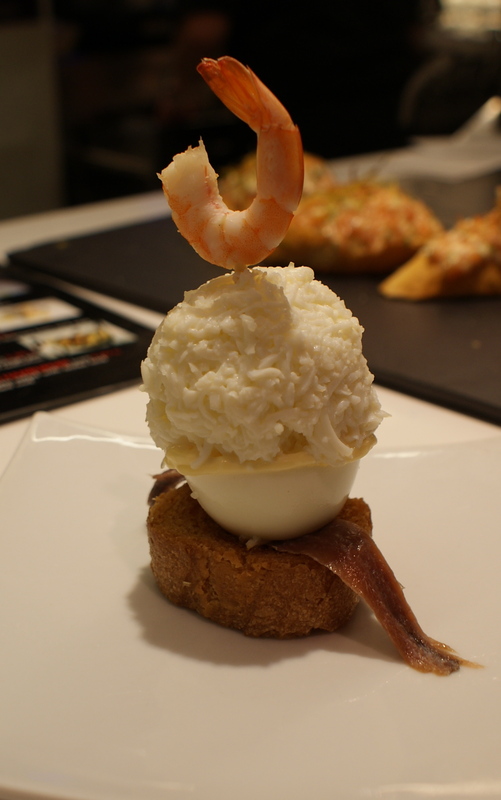 If ever there was a food mecca, then San Sebastian must be up there in the running to qualify. We are two days in and continue to be amazed and delighted by what we are experiencing. It truly is a food (and drink) lover’s paradise. Last night, we tried out a little local gin place I found round the corner from my apartment. It was glamorous and yet quite unassuming sitting there outside the tourist patch with the football on the telly and a wall of big wine glasses. But the frontage belied the contents and we soon found ourselves transported into a whole new world of gin. These showcase spirit places are popping up all over now as the brands begin to understand the need to connect the drinker with their liquid of choice and I can only assume that this one, opened a year ago, is sponsored by Hendricks. But whoever is behind it, there was the world’s choice of gin here and every accessory to pimp it up into a whole new stratosphere. 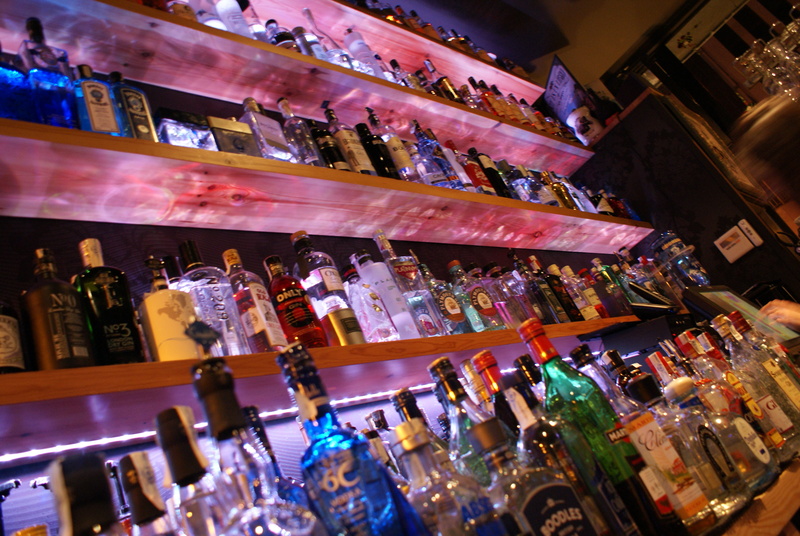 Who knew there were so many gins in the world! You start by choosing your gin. 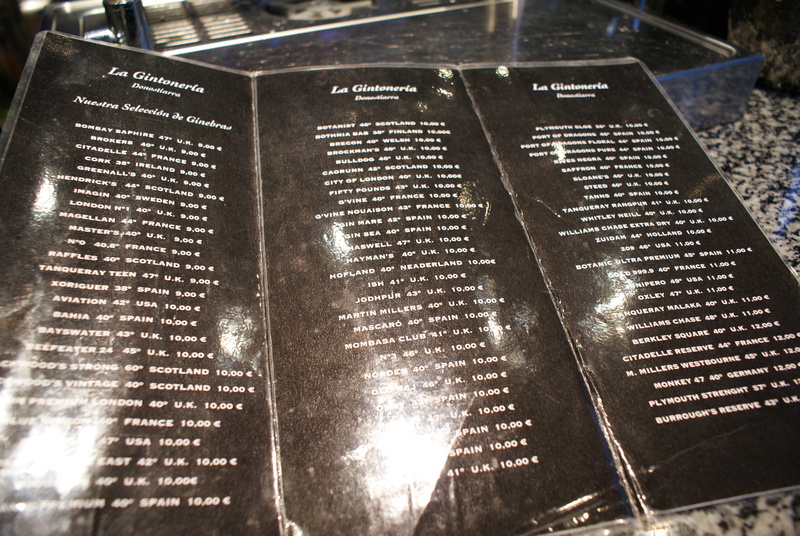 Now that might sound easy, but with a menu of 80 gins, it can be a little overwhelming. As someone who is not a great expert in this field, I asked for their signature one which turned out to be the French Citadelle. Mr Jones went for one of the four Tanquerays. Now the magic begins. For each gin, our beautiful bartender embarked upon an elaborate (and lengthy) process to create the ultimate gin and tonic. To start with, she took a giant goldfish glass that is normally associated with quality wines and placed (with tongs, no less) a selection of fruits, spices and bitters that complement the botanicals in the chosen gin. For the Citadelle, this included star anise, pink grapefruit and juniper. 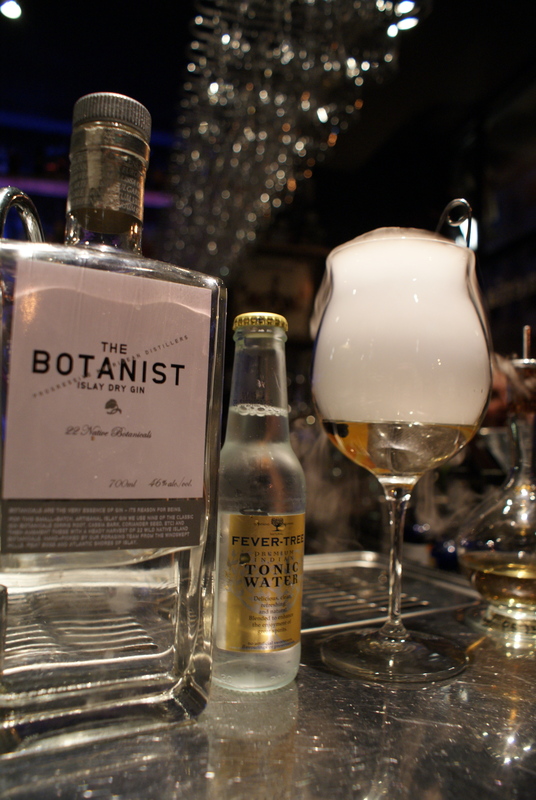 Then came a lovingly poured substantial measure of the gin, followed by a teastrainer ball of dry ice. 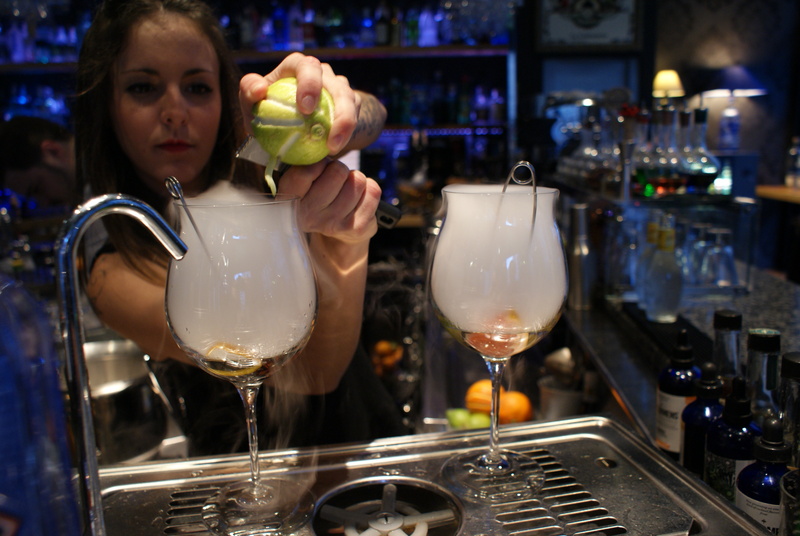 I am not sure if gin is meant to be served at a very cold temperature, or whether this was all about the magic of the experience, but it certainly felt like gin alchemy as the smoke rose gently up through the glass. Then we had the addition of citrus zest, cut directly into the glass, some bitters (cardamom for me) and a huge dollop of giant ice cubes, once again placed with care and precision. To round it off, a splash of tonic, a final flourish of zest to get the citrus oils hovering under your nose and voila! 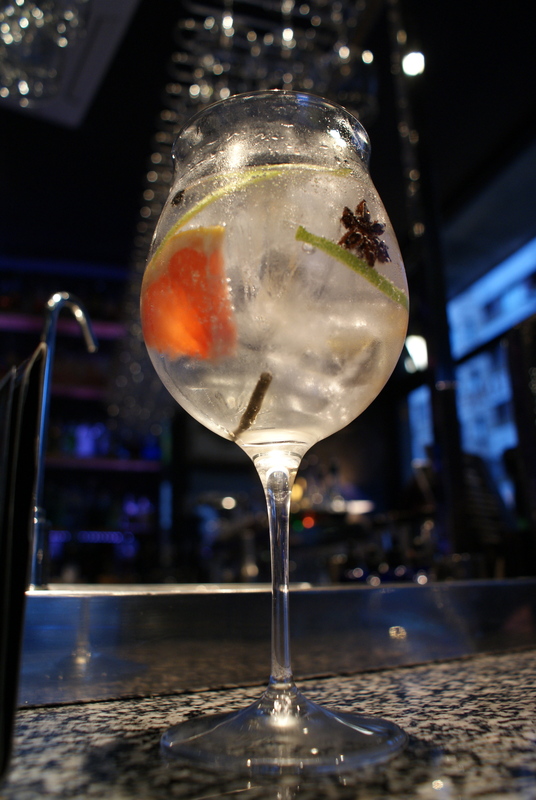 gin and tonic San Sebastian style. So was it worth it, I hear you cry? Well, yes actually. We were certainly hooked and as someone who doesn’t exactly drink very much, it really was lovely. Mr Jones went back for more, opting for the peaty Botanist gin made by Scottish Whisky makers and complemented with whisky and lots of orange but I left it at one, supping up every last drop despite the complications of managing those giant ice cubes falling up my nose. I am sure we will sneak another one in before we leave.